Cranberries are a group of evergreen dwarf shrubs or trailing vines in the subgenus Oxycoccus of the genus Vaccinium. In some methods of classification, Oxycoccus is regarded as a genus in its own right.They can be found in acidic bogs throughout the cooler regions of the northern hemisphere.Cranberries are low, creeping shrubs or vines up to 2 metres (7 ft) long and 5 to 20 centimetres (2 to 8 in) in height;they have slender, wiry stems that are not thickly woody and have small evergreen leaves. The flowers are dark pink, with very distinct reflexed petals, leaving the style and stamens fully exposed and pointing forward. They are pollinated by bees. The fruit is a berry that is larger than the leaves of the plant; it is initially white, but turns a deep red when fully ripe. It is edible, with an acidic taste that can overwhelm its sweetness. The name cranberry derives from "craneberry", first named by early European settlers in America who felt the expanding flower, stem, calyx, and petals resembled the neck, head, and bill of a crane. Another name used in northeastern Canada is mossberry. 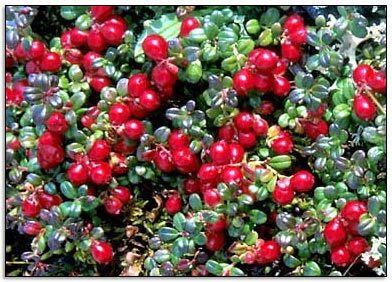 The traditional English name for Vaccinium oxycoccos, fenberry, originated from plants found growing in fen (marsh) lands. In 17th century New England cranberries were sometimes called "bearberries" as bears were often seen feeding on them. In North America, Native Americans were the first to use cranberries as food. Native Americans used cranberries in a variety of foods, especially for pemmican, wound medicine and dye. Calling the red berries Sassamanash, natives may have introduced cranberries to starving English settlers in Massachusetts who incorporated the berries into traditional Thanksgiving feasts. American Revolutionary War veteran Henry Hall is credited as first to farm cranberries in the Cape Cod town of Dennis around 1816. In the 1820s cranberries were shipped to Europe. Cranberries became popular for wild harvesting in the Nordic countries and Russia. In Scotland, the berries were originally wild-harvested but with the loss of suitable habitat, the plants have become so scarce that this is no longer done. Medicinal use: Raw cranberries have moderate levels of vitamin C, dietary fiber and the essential dietary mineral, manganese, as well as a balanced profile of other essential micronutrients.By measure of the Oxygen Radical Absorbance Capacity with an ORAC score of 9.584 units per 100 g, cranberry ranks near the top of 277 commonly consumed foods in the United States.